1. A specialist in the practice of blood and lymph vessels of the body. 2. A doctor who specializes in the knowledge of blood and lymph vessels. 1. The study of the blood and lymph vessels of the body. 2. The sum of knowledge about the blood and lymph vessels. 3. The scientific study and body of knowledge of the blood vessels and the lymphatic system. The pathology of, or the changes seen in, diseases of the blood vessels. 1. The study of pollination and the relationships between insects and flowers. 2. The interrelationship of flowers and flowering plants with their environments. Someone who specializes in the study of and observations of the interactions of flowers and their environments. The relationships and interactions of flowers and their environments. 1. An editor who makes selections for a collection of literary passages or works; especially, poems, by various authors. 2. Someone who is a compiler of a collection of artistic works which have a similar form or subject, often those considered to be the best. 1. A collection or representative sample of writings, poetry, etc. of a particular style or of a theme: For her birthday, Mildred received an anthology of the poetry by Carl Sandburg, a famed poet from the United States. 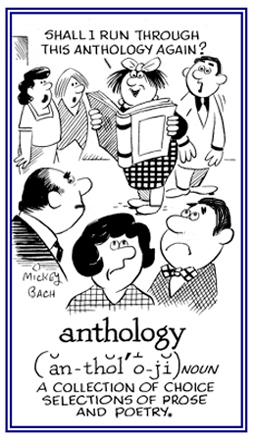 Anthologies are extended to other literary collections; such as, a reference to paintings, songs, etc. ; and other art forms. 2. Etymologically, the origin, morphology, physiology, distribution, and classification of flowers: An anthology is a literary collection of the "flowers of verse"; especially, of poetry. © ALL rights are reserved. 1. Someone who pursues the science of mankind: Efforts to establish the geographic origins of the different peoples have been supported with methods developed by biological scientists, particularly those concerned with the study of human heredity. 2. Anyone who is professionally involved in, or versed in, the study of the human species and their ancestors: Anthropologists have made considerable use of information provided by archaeologists in their attempt to understand the origins of modern customs, art, and social and political life. Anthropologists seek to study and to interpret the special characteristics of any particular population or activity in terms of its time and place in the total history of mankind. 2. The study of the interrelations of biological, cultural, geographical, and historical aspects of humankind: Anthropology is the study of the social and biological aspects of humankind, both past and present because humans are intrigued by who they are, where they came from and why they behave the way they do. 3. The branch of the science that investigates the position of man zoologically, his evolution, and history as a race of animated beings. The objective study of anthropology has led to the idea of cultural relativity, meaning that all societies must be evaluated within their own cultural frameworks. Specialists in anthropology attempt to understand human nature and mankind's' place in nature; therefore, as a highly diverse discipline, anthropology is concerned with the sociocultural as well as the biological side of humanness. The three main events in a human's life are being born, married, and buried; in other words, hatched, matched, and dispatched. The application, or attribution of human characteristics, to God, or to a god: Anthropomorphology is properly applied to any religious statement, with either literal or symbolic intent, which depicts a deity as existing either wholly or partially in bodily form resembling that of a man, or as possessing qualities of thought, will, or feelings that are like those experienced by humans; such as, the "hand of God" and "the wrath of God". The study of the reciprocal action of the human race and the environment: Anthroposociology involves the sociological study of the physical characteristics of people including social groups and the classifications of human races. Someone who is a specialist in the systematic and scientific study of honey bees. The scientific study of bees; especially, honey bees and the making of honey. Showing page 6 out of 80 pages of 1193 main-word entries or main-word-entry groups.